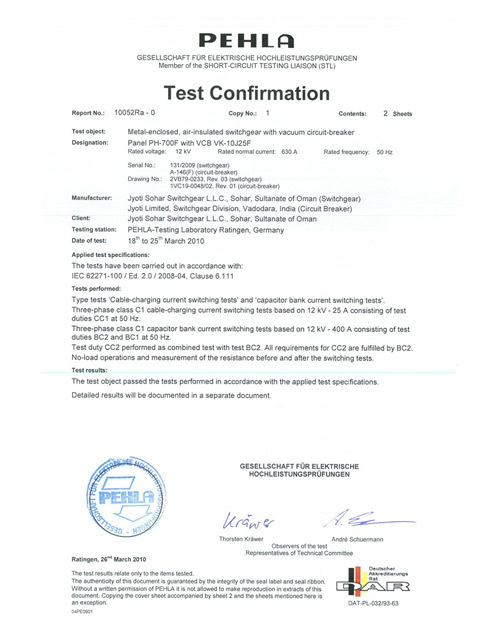 PEHLA (Prüfung Elektrischer Hoch-Leistungs-Apparate i.e Examination of Electrical High Power Equipment) is an internationally accepted testing agency for Certification of Medium voltage switchgear based in Germany. We had sent our entire range 12kV 25kA and 40kA products for type testing as per latest standards IEC 62271-100 and IEC 62271-200. All the samples passed the tests with flying colours in the first attempt. The entire testing was completed in 30 days. 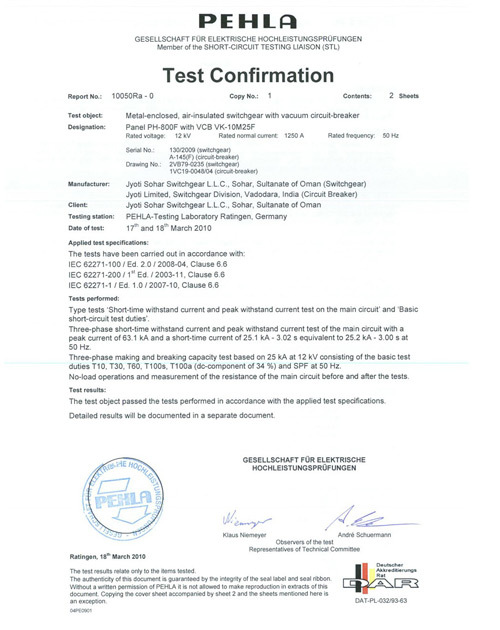 Passing of these tests is a reconfirmation of quality of Jyoti Medium Voltage Switchgear. With this type testing our products can now be globally accepted and we can export our Medium Voltage Switchgear to international markets. Jyoti Ltd has developed SF6 RMU with the technical collaboration with Elmecon Ltd. UK. Jyoti make SF6 Ring Main Unit is under final testing. This RMU is registered with the name Jyoti Ring ™. Jyoti Ring is for Safe & Smooth Switching. Jyoti Ring is 12/15.5kV total solution in distribution network. Jyoti Ring can be supplied in various configurations considering customer’s requirement. Jyoti Ring also provides full extensibility for present & future expansion. Jyoti Ring will be delivered as a complete sealed unit in 3mm stainless steel tank containing all switching & live parts inside. Constant atmospheric conditions in sealed tank operation of the unit ensure safety, reliability & maintenance-free system. Jyoti Ring consists of a common design for indoor & outdoor application without any add-on covers. Jyoti Ring is compactable for remote monitoring & control operations as well. Compact & robust British design. Multiple configurations. Maintenance free product. High Flexibility. Less moving parts. Remote monitoring. Jyoti has developed ultra modern manufacturing facility for this product. For conforming the international Quality Standards, most sophisticated & latest equipments are used.